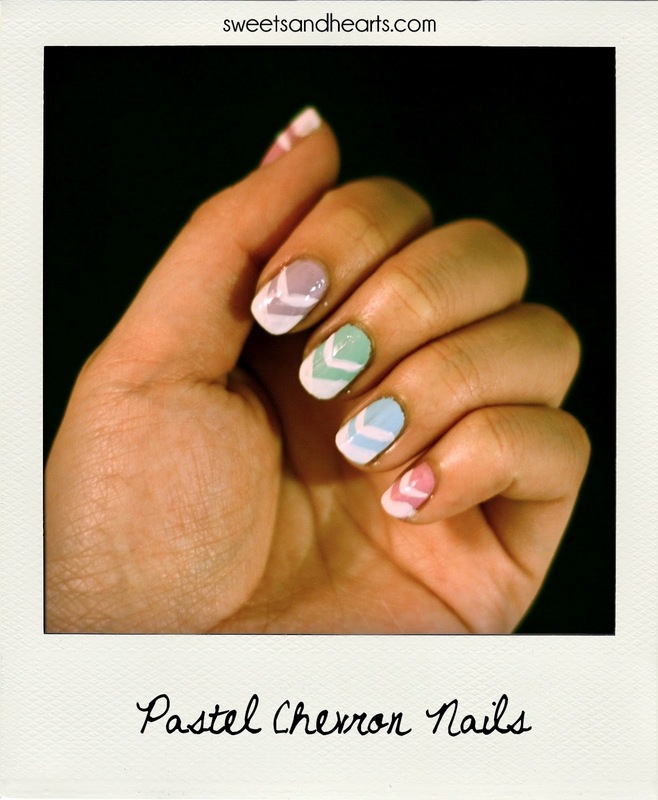 Inspired by Easter nail art and M&M worthy pastel shades, I wanted to do something pretty, with a modern twist. I already knew I wanted to do multi-color, and then I wrestled with different pattern ideas: should I make them look like Easter eggs? Polka-dots? Diagonal stripes? Bunnies? Then I remembered one of my favorite spring trends from this year: chevron stripes! It actually wasn't too hard. Just paint two coats of the solid colors, then use a regular white polish to paint the angled tips. The easiest way to do this is to hold the brush at an angle starting from the side of the nail towards the center, and carefully pressing the brush rather than painting in strokes. Repeat on the opposite side of the nail to create a sharp point. Using the same technique, use a striper white polish to create the smaller angled stripes under the tips. Seal with a topcoat. What's on your nails right now? Anything for Easter or spring?